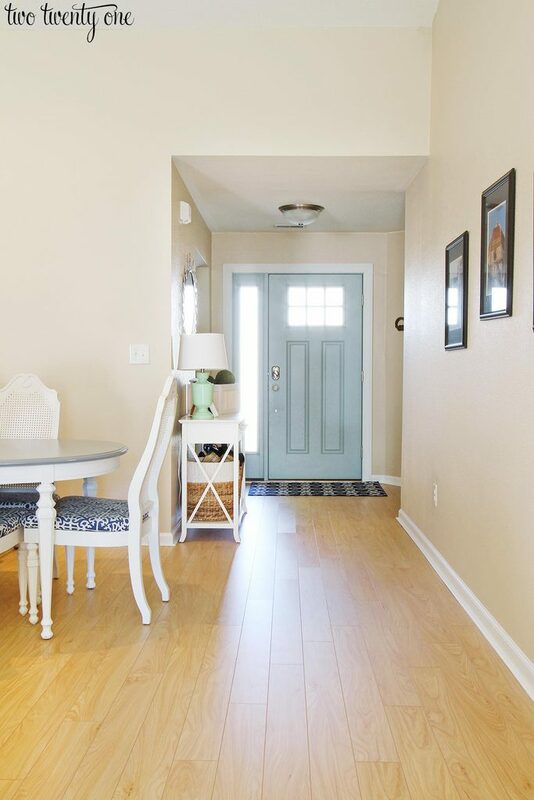 Last week I showed you our new laminate flooring. 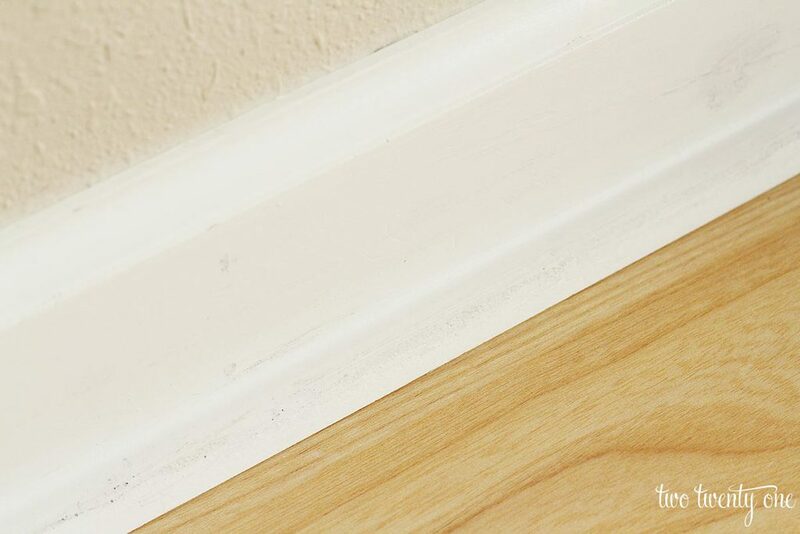 With the new flooring came the process of caulking and painting our baseboards since shoe mould had to be used to cover the gap between the flooring and the baseboards. 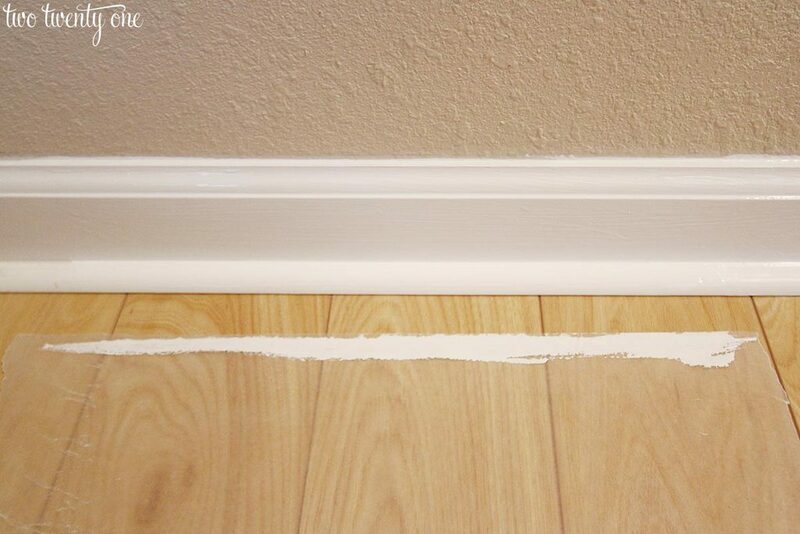 To be honest, it was time to paint the baseboards anyway. 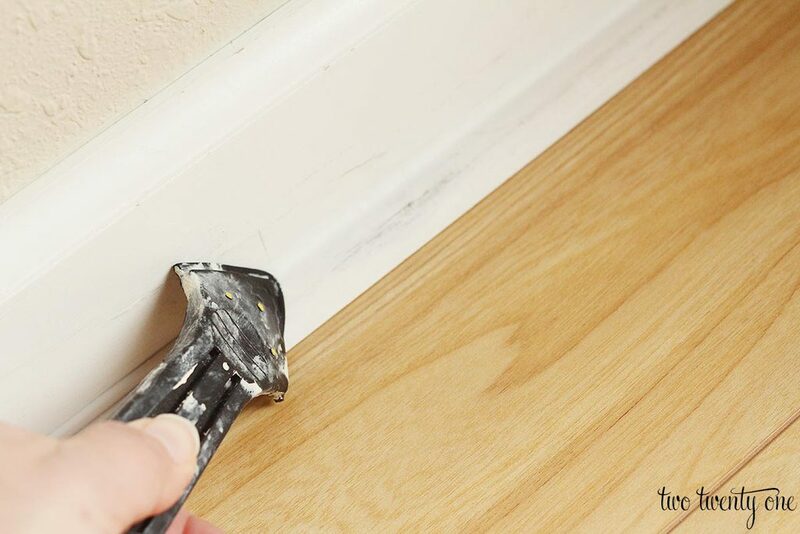 I’m no professional caulker or painter, but I agreed to share my tips. After filling all the nail holes and cleaning the baseboards and shoe mould, it was time to caulk the area where the baseboard met the shoe mould. 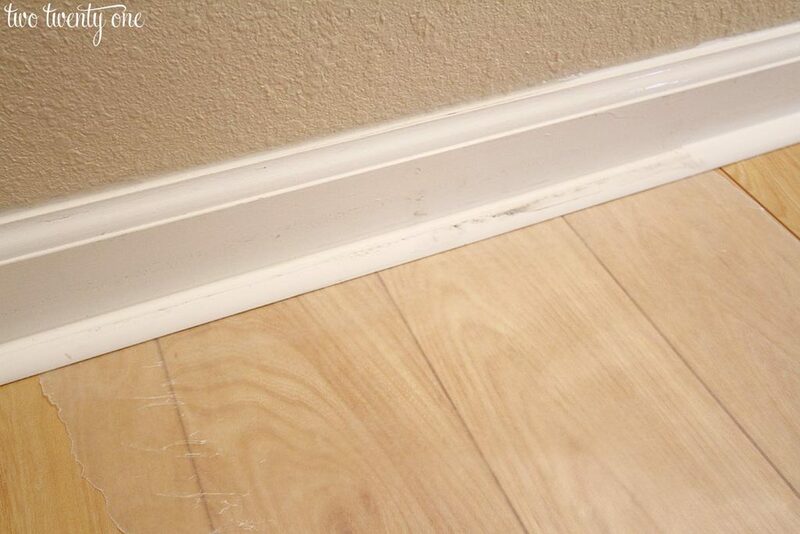 I also touched up some spots where the baseboards met the walls. Per the caulk tube instructions, I cut the tip at a 45 degree angle. 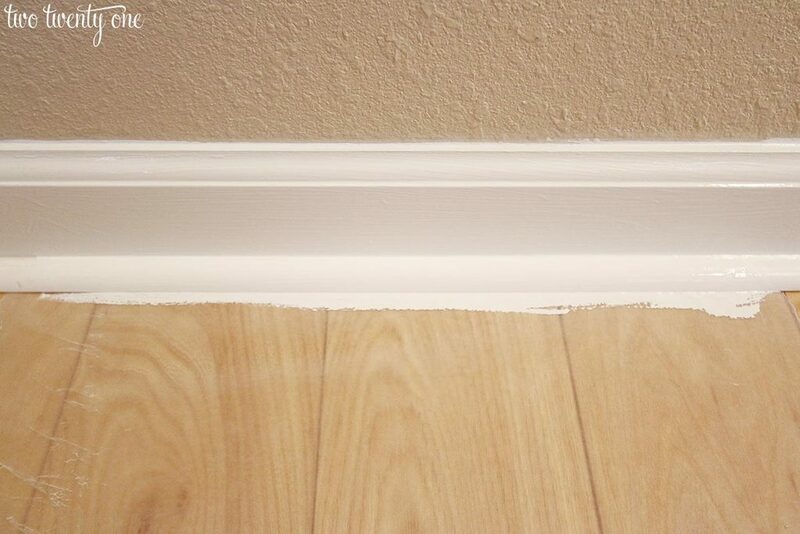 Then, I used the caulking gun to apply a band of caulk where the baseboard met the shoe mould. 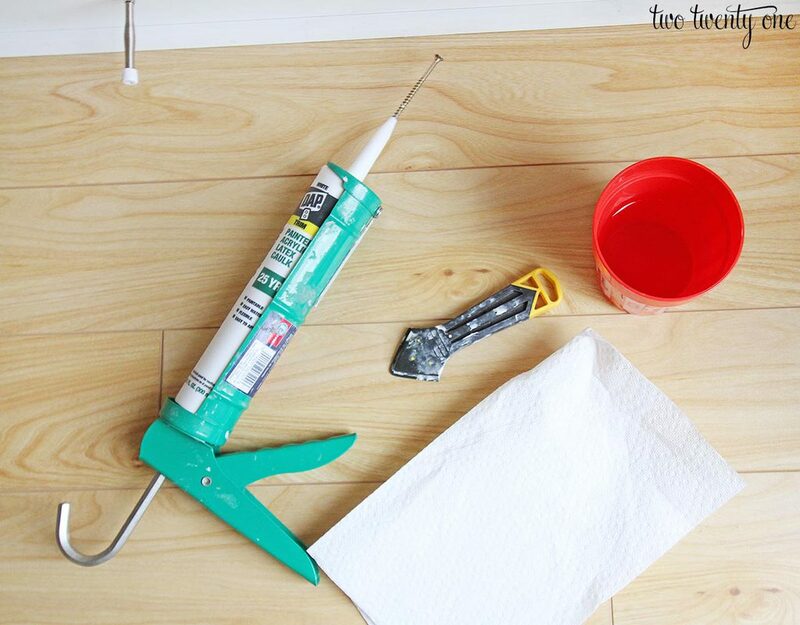 I’d dip my caulk finisher in water in order to help it move smoother when using it. Then, I pulled the caulk finisher across the caulk, applying the same pressure the entire time. I wiped the excess caulk off on the paper towel. To prevent the caulk from drying out, I inserted a large gauge screw into the opening of the tube. 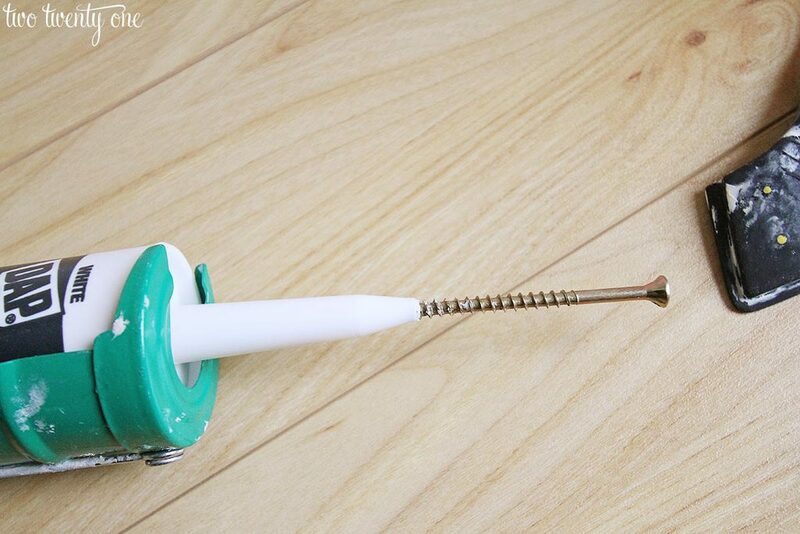 This is helpful if you can’t caulk everything at the same time. Once the caulk was dry, it was time for paint. 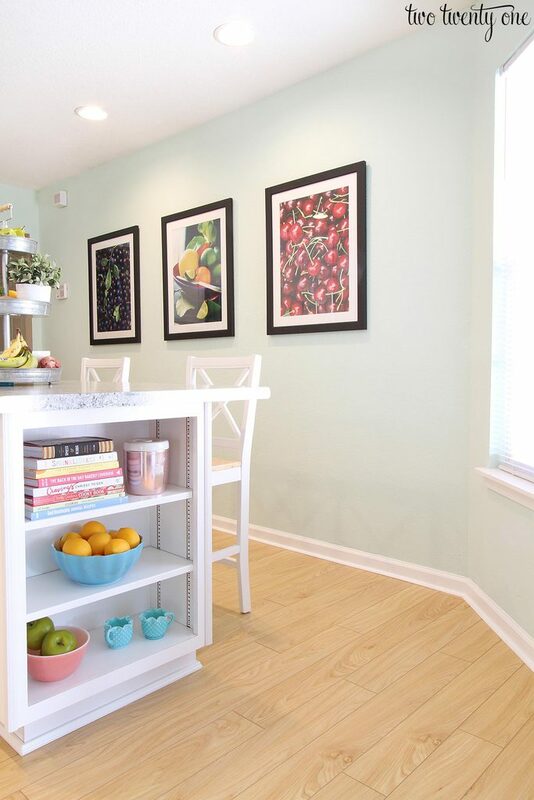 I used white paint I already had, which was Sherwin Williams extra white satin. 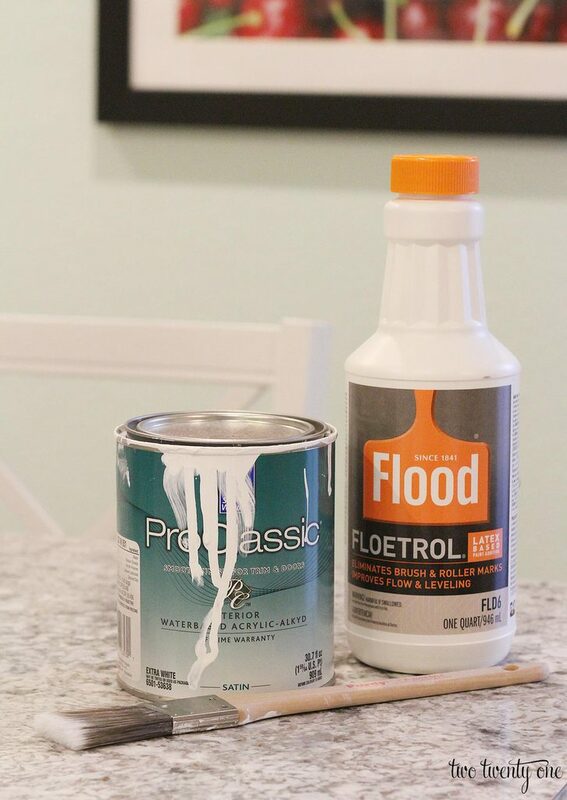 To reduce the appearance of brushstrokes and slow the drying process, I added one of my favorite paint products– Floetrol. You can find it at most home improvement and hardware stores. I also used a 1-inch angled brush. One trick I learned from Aaron, our friend who installed the flooring, was to use wax paper, when I could, under the shoe mould to keep it from getting on the floors. I’d slide a piece of wax paper under the shoe mould, hold it in place, and run my paintbrush over the moulding. Before the paint had time to dry, I’d remove it, pulling directly out from under the moulding. In areas where I couldn’t fit the wax paper, I’d try my best to stay on the moulding. If I happened to get any on the flooring or walls, I’d use a wet rag or baby wipe to wipe the paint off. Since I added the Floetrol, it gave me some extra time to get the paint off the flooring. I have to admit that I wasn’t the most careful with getting the trim paint off of the walls since I intend to paint those soon. To get the most use out of your wax paper, I suggest cutting the sheets in half or thirds. Crawling around on your flooring isn’t the most pleasant sensation so I recommend wearing stretchy pants, using a cushion for your knees, and listening to some enjoyable podcasts or music. Loved to learn about the caulking tool!!!! 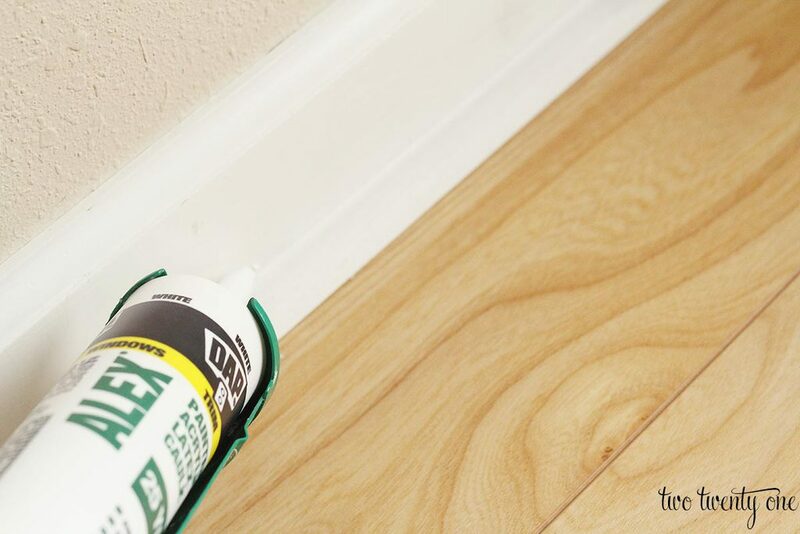 I’ve fallen in love with the miracle or caulking joints when doing any kind of woodworking project. It really is the magic that makes everything come together. A contractor friend of mine gave me a little tip for cutting the tip of the caulking tube – cut it at a 45* angle, and then take your knife and cut the tip to a V by just trimming each side of the very tip. It gets into the joint a bit more and wastes less caulk. Works like a charm! Love the new look of the blog too! Love it! Using that soon. Thanks! 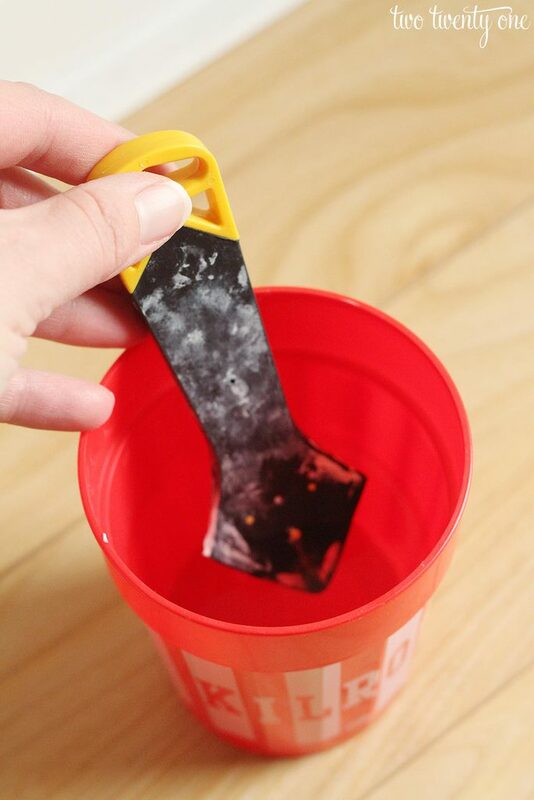 Love the wax paper tip–will be using that for sure for our bathroom paint job. Don’t want to mess up my new tile!